Old school hot yoga. Maroon, fat down vest and leg warmers. 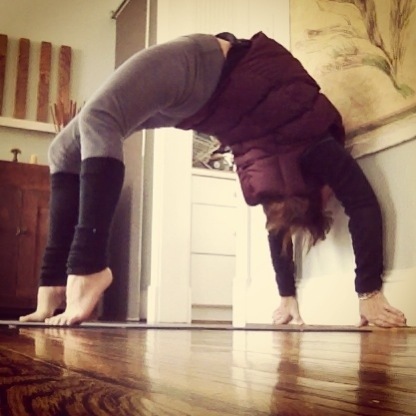 Doesn’t make the back bend any easier, although tripod hands at baseboard and tip toes does. Not my favorite. Often makes me cry. Need to get back on the back bending bandwagon. As this picture reveals. Okay okay. Nag myself.